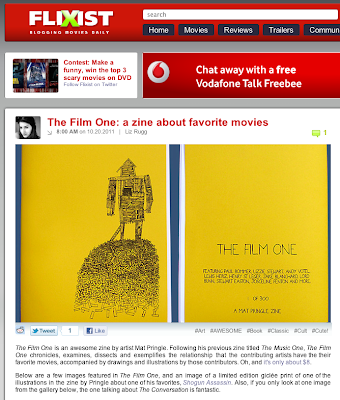 'The Film One' zine is officially blowing up - it's been brought to my attention that is has been featured on the fantastic Flavorwire website - click here for a nice list of illustrated zines that are rocking it. I'm in there twice. Twice the rocking it. It's also been featured on Flixist - a great blog about movies. I think they mean films but it's okay because they're nice to me. Click here to read more - "The Film One chronicles, examines, dissects and exemplifies the relationship that the contributing artists have with their favourite movies". I did not know it even did that. America must be sharing their copy because I really haven't sold that many of them.